"Injustice: Gods Among Us" - Chapter Twenty Four: "One Man Army"
Apokolips has invaded Earth under Kalibak's command, and while Superman has defeated Kalibak, the invasion pushes onward in cities like Moscow, Shanghai, and Gotham. The forces are too great for the League, and it looks like a job for Superman. Superman continues to beat on Kalibak, who has conveniently yielded. Kalibak is surprised at Superman's rage, and even though he alerts Superman to the fact that he is immortal, Kalibak is a New God, the thrashing continues. The scene cuts to the Flash about to save a woman in Mumbai, but Superman interrupts his at super-speed, and they have a light speed conversation. Superman asks the Flash if he knows of any other way, aside of killing the parademons, that they can save the lives of the people at risk. "No" is the Flash's response. Superman takes to a sub-orbital position, then returns to Earth and literally incinerates every parademon on Earth. Superman returns to Lex Luthor, who lifts his bloodied fist, as the people shout "Superman! Superman! Superman!" Story - 4: It's amazing what Taylor has set-up in Injustice: Gods Among Us. This is a cautionary tale of absolute power absolutely corrupting the most incorruptible man on the planet, due to standard superhero trauma. We have to wonder what would have happened if Lois had been murdered before Clark became Superman, and what the outcome would have been then. Nonetheless, this is the scenario we've been given, a faux-tragedy centered on whether or not superheroes should kill... for a video game that specializes in fatalities. The idea of a hero is, traditionally, the individual who can rise to the occasion, where others cannot. It's not that they don't want to, it's that they don't possess the qualities of the hero in terms of courage, temperance, charity, etc. However, heroes are still within our realm of possibility. We can solve the problems of crime, poverty, war, and the lot, once we get around to it, of course. Superheroes are different. Superheroes are supposed to be able to surpass our limitations, hence them being superheroes. If our limits are theirs as well, what good are they? Art - 3: I prefer Derenick to Miller's artwork, which makes Superman look like a crazed cadaver and the Flash an anthropomorphic crab, but what better way to render a dealer of death and someone reluctant to come out of their shell? 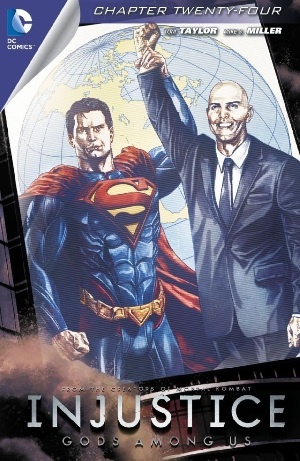 Cover Art - 4: Still nice... pretty certain Lex is the good guy.